WELL---we found another "PAPER POPPER" gun and it's a dandy !! This is another toy made by the king of popper gun manufacturing the LANGSON MANUFACTURING COMPANY. This machine gun is over eleven inches long and quite heavy. To operate, you hold the handle in the back and turn the crank. On top of the barrel is the bracket that holds the paper roll. As you crank the toy, the barrel retracts and snaps forward (with air pressure) and the action pierces the paper with a loud bang !! Notice the large metal wheel by the crank. 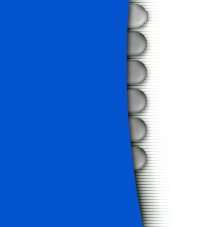 This gives the toy centripetal force to make the action smoother. You may find other Langson guns at our link page. We will keep looking for this unique type toy and if you find one, we do not have, PLEASE write us and we'll include it in our never ending popper page. While searching in the nooks and crannies of some old stores, we found two more PAPER POPPERS !!! The large (11 inches long) cardboard gun might be a streach as far as a paper popper, BUT, the sound is made by paper and it makes a popping sound. Actually, it is a variation of the poppers we made in school from an 8" X 11 1/2" piece of paper. When you swing downward quickly, the flap comes out and makes the POP !! It was fun to do when the class room was very quiet !!! Welcome to the new page of MARX TOYS !!! 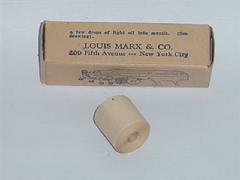 The first story we will offer is about, the rare MARX PAPER POP PISTOL. Paper shooting guns and rifles date back to the Nineteenth Century and seem to have faded away in the 1950s. The first toys, using paper for sound, we found, were folded paper (origamy) and most all, commercially made items, were for advertising. They may be found commonly on the internet. We show a sample picture we took from the internet. Do you remember folding up a sheet of paper, in school, and snapping it behind a friend to scare him or her ????? Our story follows and PLEASE, as always, write us with your experiences with the PAPER POPPER !! While doing the research, we first wanted to know who LMCO was. We thought it was a great fit for Louis Marx Company. WELL IT'S NOT !! We went to Google and found a super site that we are attaching to this story. Please, go to our link site and click on the LANGSON MFG. CO. tab and you will find a great story and history of Otto A. Langos. The person that made paper poppers famous. A question might be, who built the first popper gun. That question cannot be answered by us but knowing the history of Marx, and tracing his gun to about 1931, it was not Louis Marx's original idea. We have only found five examples of the popper that were NOT made by LMCO. They are shown in the pictures. The rifle shown with the box was made by McDowell Mfg. Co. in Pittsburgh, Pa. It is close to the one you may see at the LMCO site. They both work on the same principle IE: you place the paper in front of the barrel and pump the rod quickly. 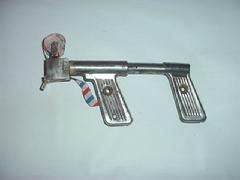 The next popper, to be made, year wise, is the MARX PAPER POPPER PISTOL. Of all the poppers we have in our collection, this is the only one that when you pull the trigger, the paper is burst, and at the same time, THE GUN SHOOTS SPARKS !!! from the ventlated rib on the top front !!! Marx's gun is all stamped metal (steel). The next gun is silver painted die cast with heavy tin, trigger and mechanism. It is called PAPER POPPER and we think it was made in the 1950s. It operates on the same principle as all the toys IE: when you pull the trigger, the paper advances, the plunger retracts, the sear is released and at the same time, a rubber gasket contacts the paper and a short blast of air explodes the entrapped paper. The last two were made by Buddy L and are marked MAIN MACHINE CO. They are a machine gun type. Both have a crank and by turning the crank, it advances the paper and explodes it-- most likely the same as all the poppers do. They are 30 inches long and appear to be from the late 1940s into the 1950s. When this writer was very young and at a Kiwanis picnic, the joy of my day was to run a race and win a LMCO PAPER BLASTER PISTOL. 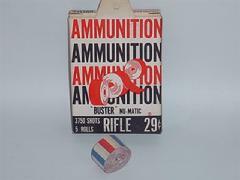 When there was no more ammunition, I remember cutting newspaper into strips and rolling it up for a new round of AMMO !!!! Check this site and the Langson site often for updates. And as always-------------- HAVE FUN !!!!!!! We found two more PAPER POPPERS and have added them to the pictures. The Red gun, with the original paper roll, has been repainted. The original color appears to be a much lighter red to almost orange. It has no manufacturers name. Perhaps a reader recognizes it. It measures 4" X 7" and has two metal fingers to advance the paper. 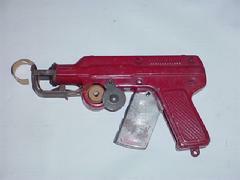 The second POP gun is made by LIMCO and was made for the 1933 Chicago Worlds Fair. The story about this gun may be read by going to the LIMCO site found on our link page. It is 4" X 10" and the paper roll was made by LIMCO. We bought 3 boxes of AMMO on line and this is what it looked like. If you find a POPPER that is not listed, please write us and we will update the story of PAPER POPPERS !!!!! !